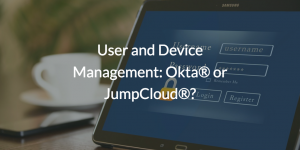 User and Device Management: Okta® or JumpCloud®? Home » Blog » User and Device Management: Okta® or JumpCloud®? The Identity-as-a-Service (IdaaS) and Single Sign-On (SSO) spaces can be confusing. They both fall under the broader Identity and Access Management (IAM) space. Although we consider Okta® complementary to JumpCloud Directory-as-a-Service® and we have a number of joint customers, we often get the question of whether users and devices should be managed in Okta or in JumpCloud. Often, the potential clients we speak with are comparing JumpCloud against Okta for their core user management functionality. We understand some of the confusion, and want to clarify how you can leverage both Okta and JumpCloud. In short, think of Okta as your single sign-on solution for web applications (external). By contrast, JumpCloud’s Directory-as-a-Service (DaaS) is the single sign-on platform for internal devices, applications, and networks. In other words, JumpCloud is your internal solution while Okta is focused on your external applications. A directory service solution such as JumpCloud stores the core identities and then federates those to Okta. User and device management are covered by a Directory-as-a-Service solution. Primarily, access control to devices such as Macs®, Linux®, and Windows® machines are controlled by the cloud-based directory service. Users are created, terminated, or modified on each device. Further, management of those devices through the execution of tasks or commands can be handled from a DaaS solution as well. These tasks can include executing policies such as ensuring devices are encrypted, screen savers are turned on, guest accounts are disabled, or any number of other policies. DaaS solutions have the ability to do this cross-platform. These capabilities complement Okta’s capabilities, since, historically, single sign-on solutions have not focused on managing internal devices, applications, and networks. If you would like to learn more about how you can manage users and devices, drop us a note. We’d be happy to discuss how our customers have integrated with Okta and what functionality customers leverage in each solution.